William Cowle was a local grocer who invested his profits in land and property. A member of the Local Board of Health since its inception, his stubborn demand for clean water and sewers for the town exasperated the members, but delighted the voters, for more than thirty years. His first major development was the rebuilding of the old White Hart in at the top of the High Street. Exchange Buildings was the result – an elegant mews with the new Corn Exchange hotel on one side, an up-market grocery on the other side, six elegant town houses and a new house for himself at the back of the mews. Then he heard that the owners of The Field estate up above Arundel Mill wanted to sell. In 1871 he privately agreed to buy the land. He asked a local architect to plan a new suburb and, in 1873, offered 103 buildings lots at an auction to the town’s investors and built himself a new house in the centre of the estate. How did this story come to light? In the spring of 2009 I rescued my house title deeds from the Stroud and Swindon Building Society. I had just heard that the introduction of the online Land Register meant that once a house was on the Register any title deeds were just so much waste parchment unless somebody decided to keep them safe! All that wonderful detail: names, occupations, dates, margin notes, plans – not relevant in the digital age. A quick read showed that of the sixteen people who sold the plot on which my Bisley Road house was built, 13 of them were called Hawkins. The buyer was somebody called William Cowle. Who were these people? 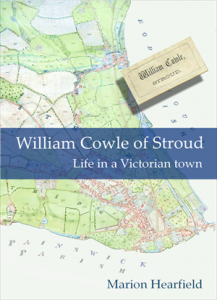 I also discovered that although William Cowle had left a bequest to fund a science museum for Stroud, the present Museum in the Park knew very little about him. 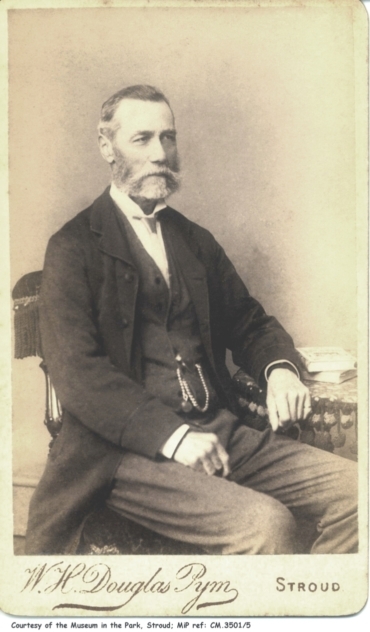 Cowle had died at the very end of 1899 and left no direct descendants. Then in 2010 Tony Macer asked if the Museum knew whose initials were on his Bowbridge Lane house: “WC 1884”. The Museum curator suggested he contact me, and that was the start of a four-year research project into the development of the hillside between the Bisley Old Road, the Workhouse (top right in the painting below), Holy Trinity church (centre left) and the turnpike along the riverside. This detail from a painting that hangs in the Museum in the Park shows what Cowle bought. The solitary house and outbuildings in the centre of the estate was the original Arundel House called (with no imagination) The Field. It is still there, on Bowbridge Lane, at the top of what is now called Cowle Road. Copies can be ordered through the SLHS website: email [email protected] (payment via PayPal or credit card; P&P charged at cost). SLHS members are offered the book at a special price – please ask at any of our meetings.